Author Written by Feliyanus Gea and last updated on Posted on January 16, 2018 . 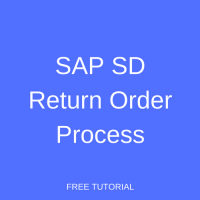 Welcome to the tutorial about SAP SD Return Order Process. 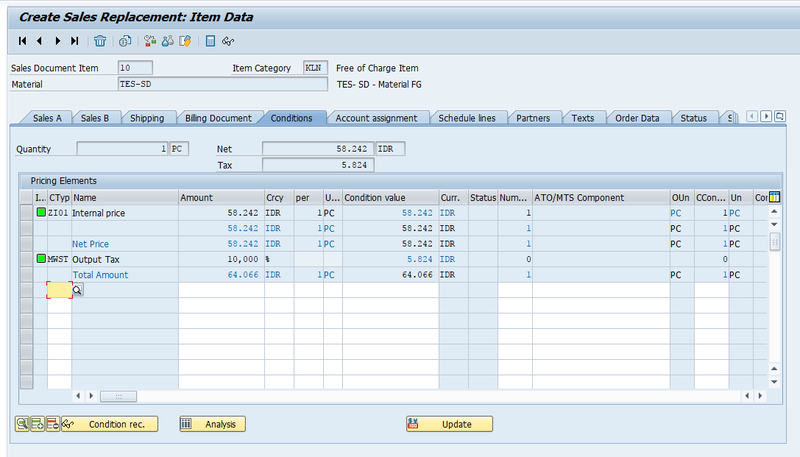 Learn how returns processing is managed in SAP SD. 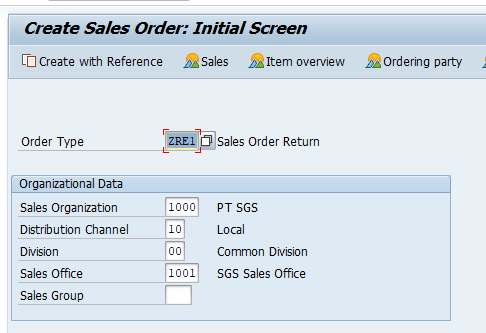 This tutorial is part of the free SAP SD course. 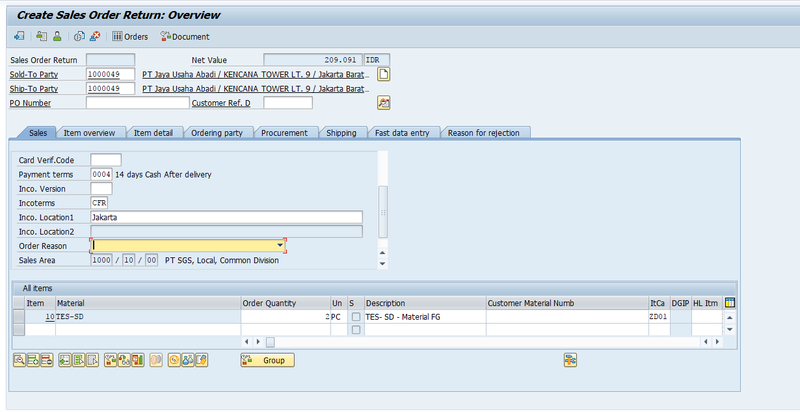 To understand the requirements for SAP SD return order process, let’s consider some questions. What if a product that has been sent to the customer’s premise does not meet the specifications or grade that has been promised? And, what if the customer decided they want to return the product? Or what if the fault is from your company’s side? What will the company do to handle the situation? 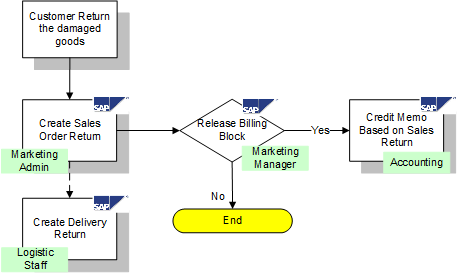 SAP ERP offers standard procedures for returns processing, either sending a new product for replacement or reducing the bill with credit memo processing. In this document, I am going to explain each process along with the steps and screenshots to make your understanding better. This process assumes that you have a billing document from the previous process that will be referenced for the upcoming return process. 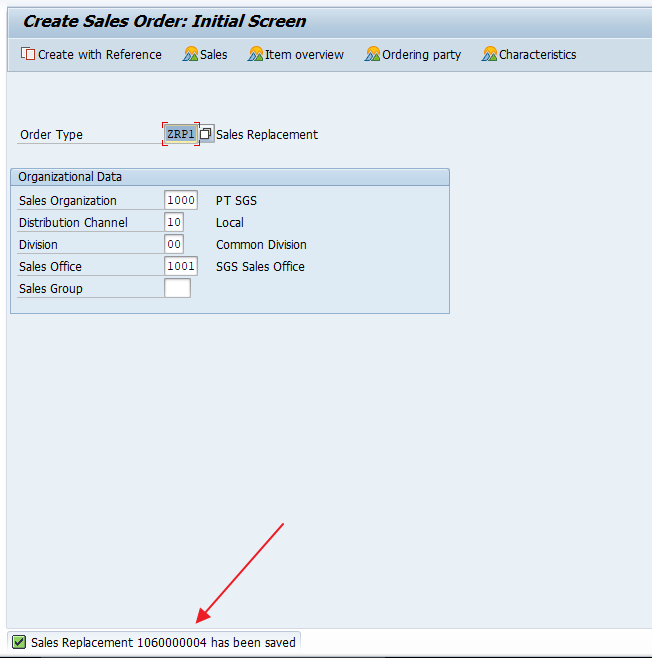 You need to create SAP SD Return Order document. 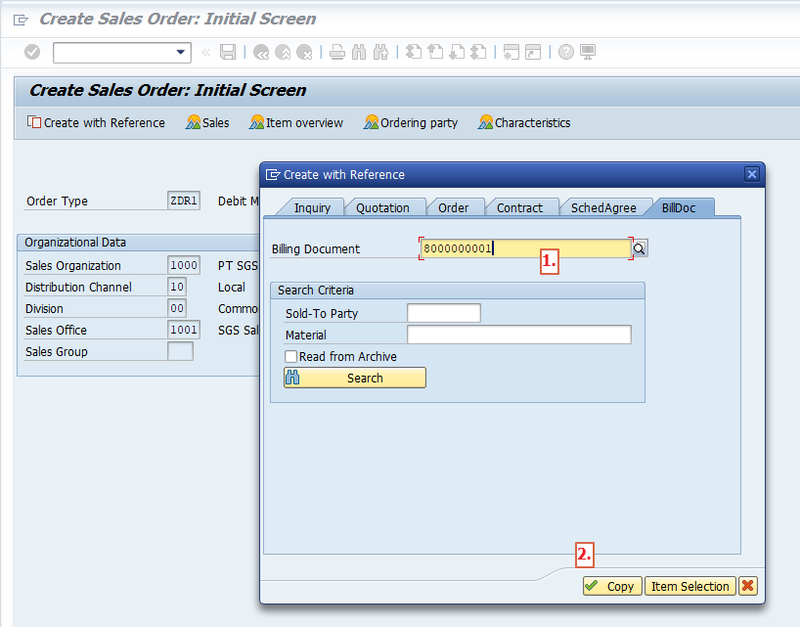 Run the transaction VA01, select the sales document type (Sales Order Return), and enter the necessary sales area. Press “Enter” button. You should look up your client’s business process to check whether a previous document has to be referenced or a return order can be created independently. For this example, I made it mandatory to enter the previous generated billing document, so a new pop up will show up. 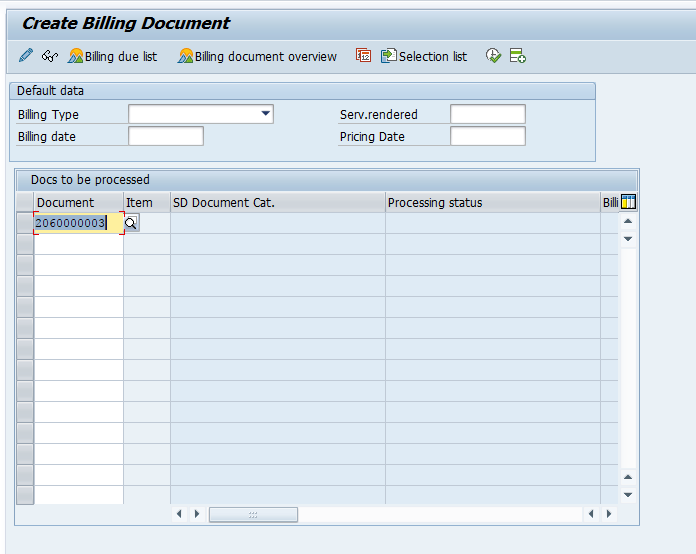 Fill the field with the billing document. Click “Copy” or press “Enter” button. 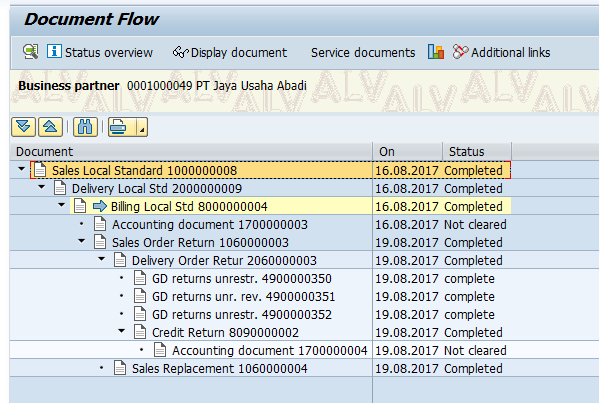 The copy control procedure will do magic by copying all of the information from the billing document (partner function information, quantity, price, etc.). There are two important things that we need to look up to. First, you need to fill in the order reason. Second one is the quantity that the customer returns to our premises. Now, you have already completed all the necessary information to create a credit memo request document. Just to make sure that nothing is missing run the incompletion log. Make sure the message is as shown above, “Document is complete”. It means that no things left behind. Click on the save button . 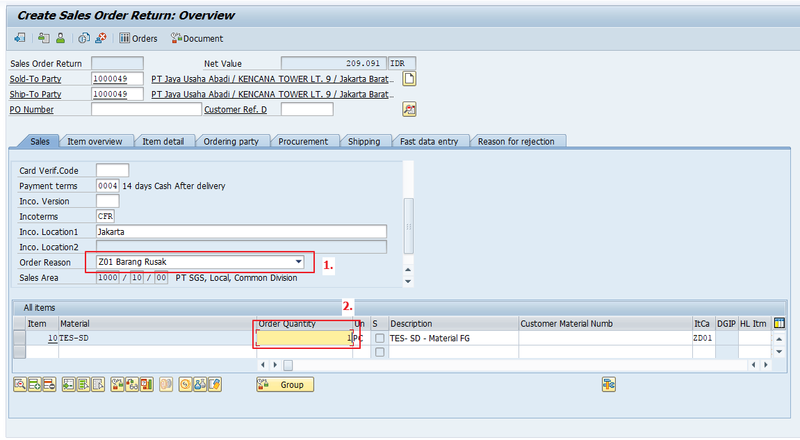 After the SAP SD return order is created, the logistic department will be normally informed by the marketing admin personnel that there will be a returned item from the customer. The logistic staff will be advised to create a return delivery. 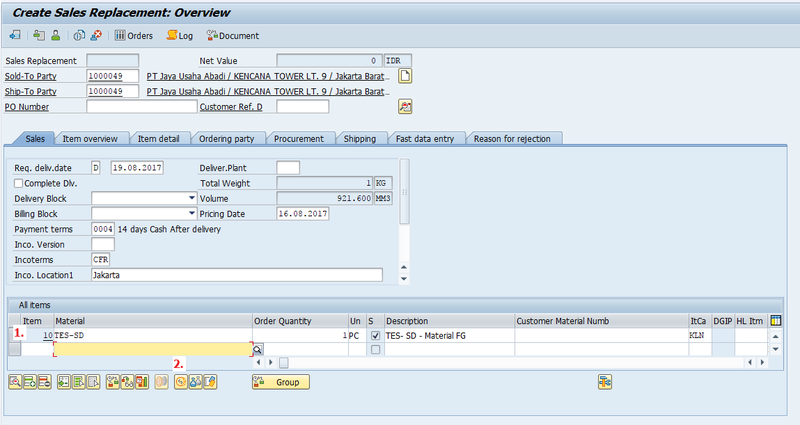 Run the transaction VL01N, enter a shipping point and order document number. In the next screen, you have to determine which storage location is going to be used (usually the return storage location). 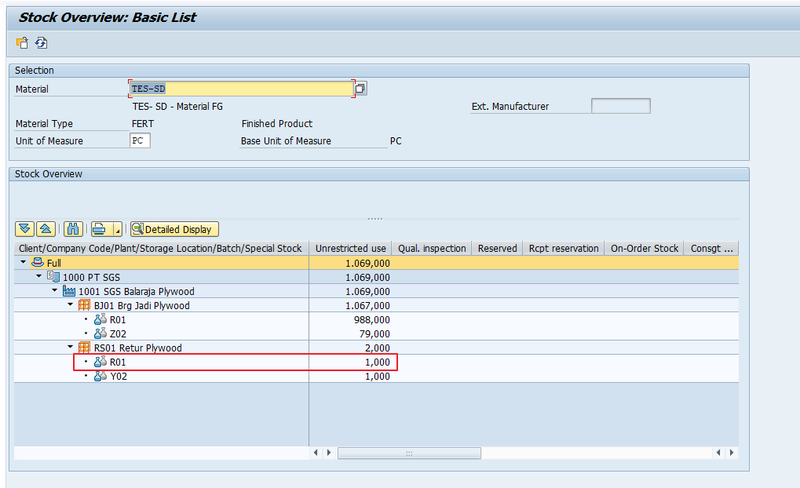 And also, if you’ve activated batch determination, you will need to insert the batch number as well. 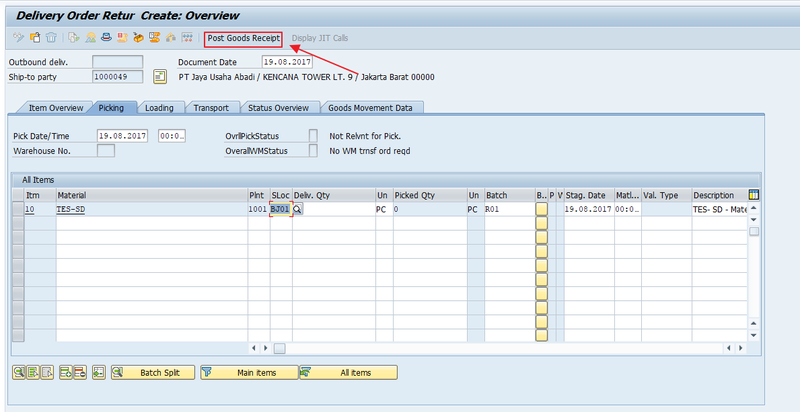 Next, click on the “Post Goods Receipt” button. Your new return delivery will now be created and a goods movement posted. 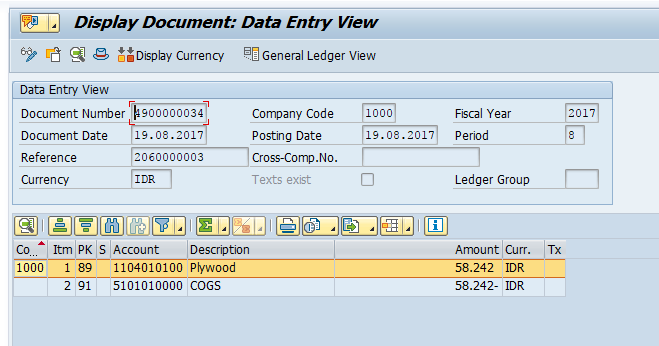 Now, let’s have a look at the accounting entries that were created. Clearly, this is the opposite of a normal goods issue. This process will put the COGS (Cost of Goods Sold) account in credit while the warehouse stock is increased. Let’s also check the impact of our posting on the stock levels. 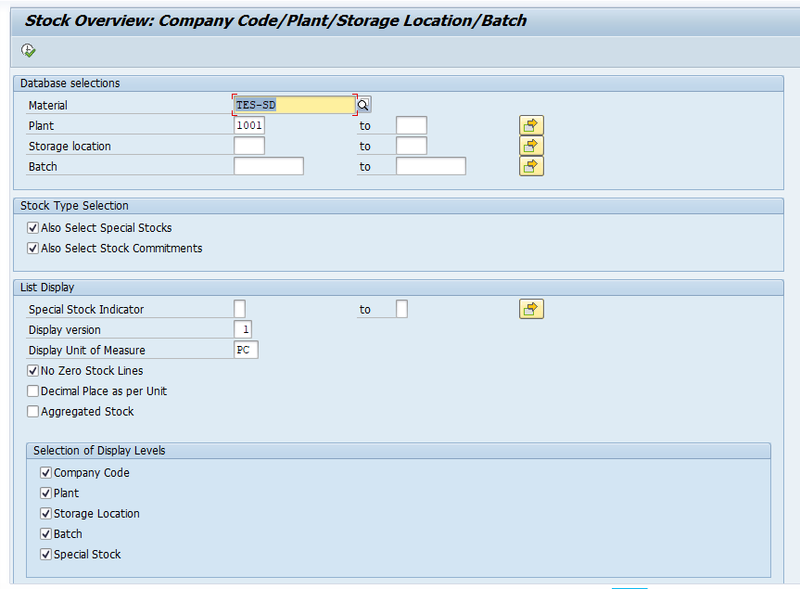 Run the transaction MMBE to check the stock in our return storage location. That newly added stock will be reviewed by the warehouse staff to decide what action should be taken on it. Now, after we received the returned material, the accounting will be informed that they should create a credit memo to reduce the sales for the certain customer. 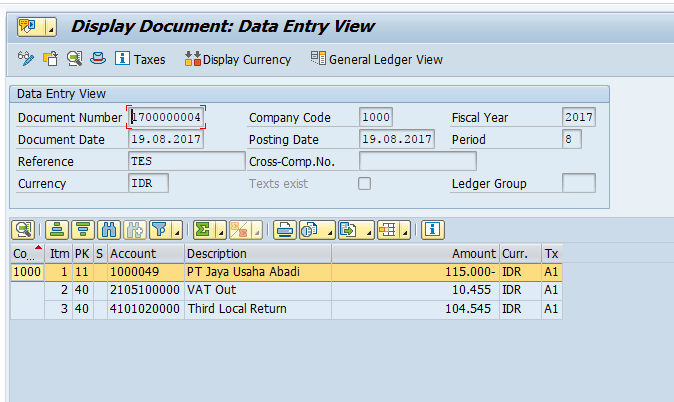 Run the transaction VF01 to create the credit memo. Enter the delivery document number and click “Enter”. 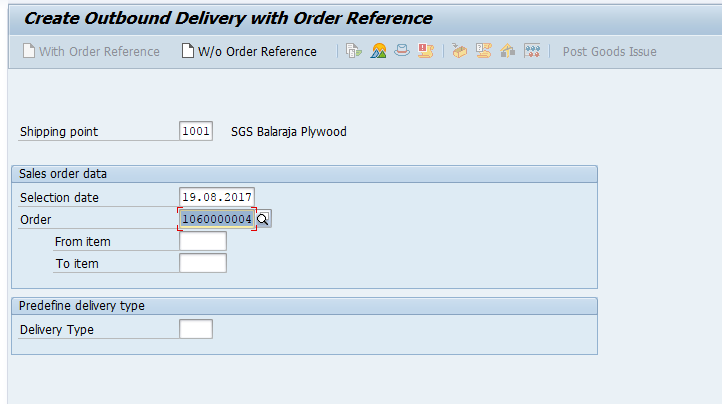 If you leave “Billing Type” blank, the system will automatically select the billing type that has been defined for that delivery document. It will also propose the billing date based on the receiving date. You can now save the document . Next, let’s look at the generated accounting document. It clearly states that the customer will be credited with 115.000 IDR. 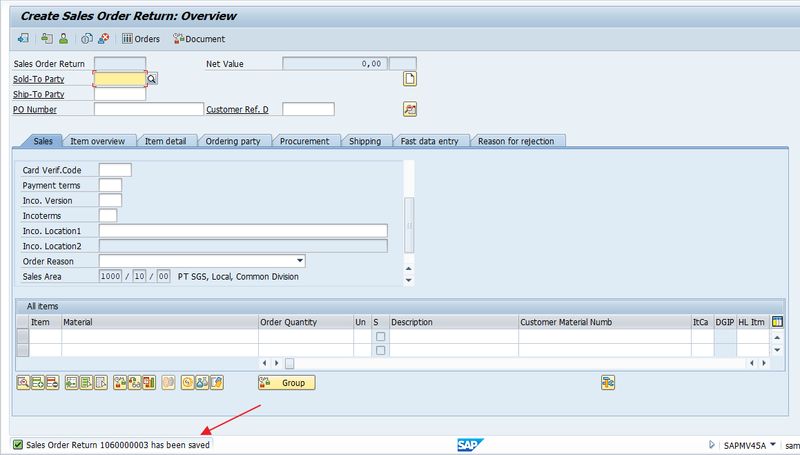 Now, let’s discuss a follow-up scenario for SAP SD return order process. This scenario occurs when the customer demands a replacement for the consequence that our company delivered a wrong or faulty item. 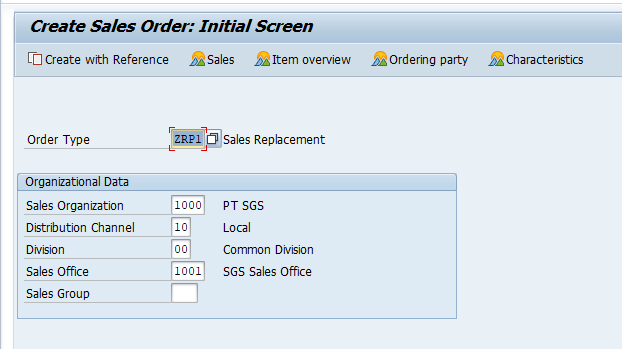 After we created the credit memo for the customer, we also have to create a replacement sales order to ship the replacement item to the customer. If you configure the system that specification of a reference document is mandatory, then you will need to enter the document number (in my case is the return sales order we created earlier). Next, click “Copy” button. 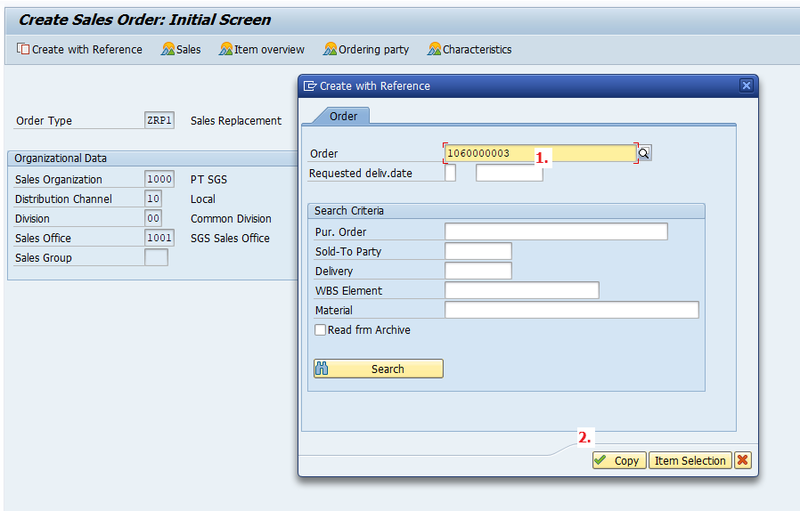 As you can see, the screen looks just like a regular sales order creation. Now, check the pricing conditions for the returned item. You will not find the base price because we are not selling the replacement item. Run the incompletion log to make sure that you didn’t forget anything. Then, click “Save” to get the document number. 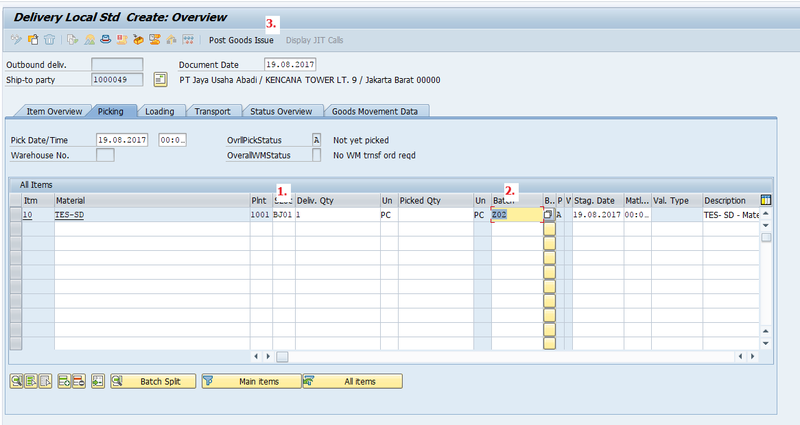 Now, run the transaction VL01N for the logistics operations. Enter a storage location and a batch number. Then, click on the “Post Goods Issue” button. The new document will be created. 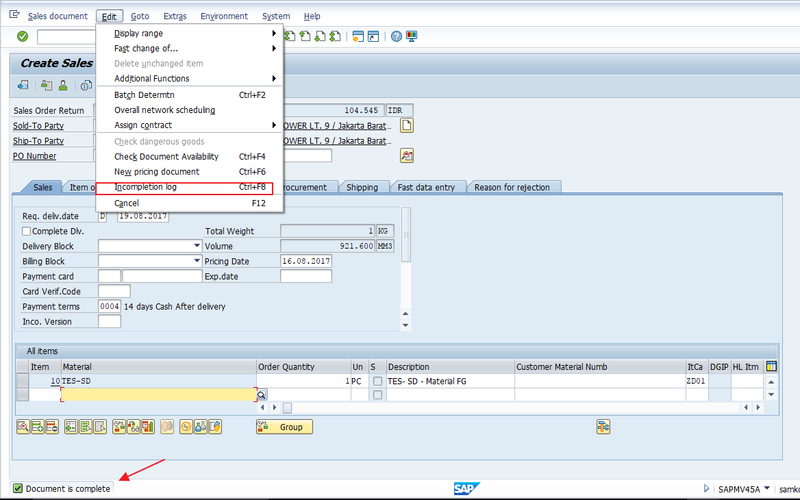 Also, let’s the document flow that captured the SAP SD return order process we have just run. You can see the chain of document. Q-1: Is it possible to create a credit memo after you finished the return order document? A-1: Yes, it is possible. 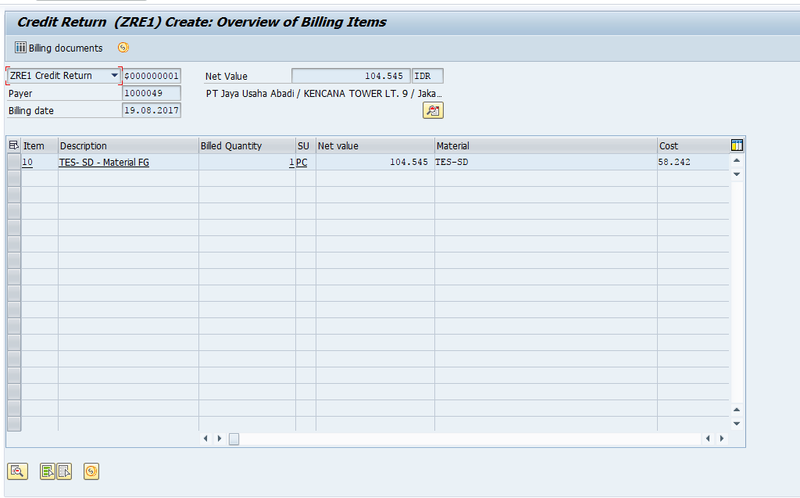 You just need to make the configuration for the copy control from a sales document to a billing document. Q-2: The returned material should be inspected by the quality assurance team. How to achieve that? First, you can change the movement type during posting goods receipt, so it will be a blocked stock instead of an unrestricted use stock. 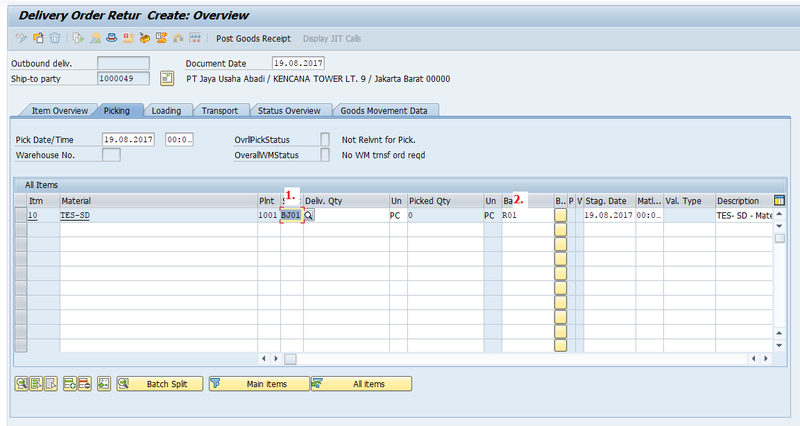 Or, you can do the transfer posting transaction by using different movement type in MIGO transaction. Did you like this tutorial? Have any questions or comments? We would love to hear your feedback in the comments section below. It’d be a big help for us, and hopefully it’s something we can address for you in improvement of our free SAP SD tutorials. Very good tutorial. It has really helped. Very much helpful.. very easy to learn. Good and simple process explained. very helpful. 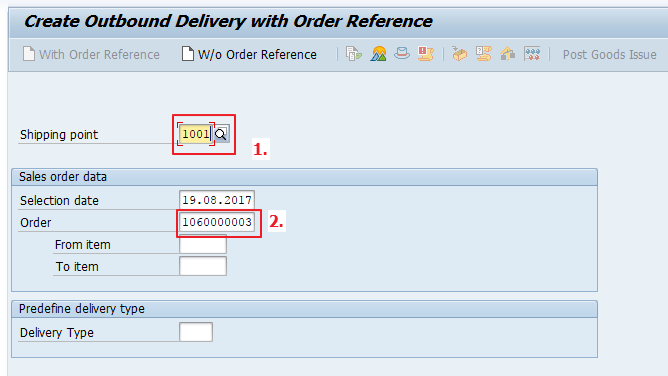 If the return order was created without a reference to the original billing document, how can you get the correct pricing (original sales price) on the return order? You will need to adjust prices manually to achieve this. just labor as a goodwill ” not charged adjustment” returned from customer, correct and ship back out, what needs to be done?